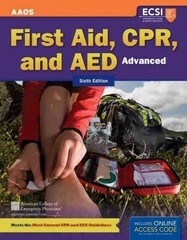 Advanced First Aid, CPR, And AED 6 Edition This Manual Is Developed For Use Within Advanced First Aid, CPR, And AED Training Courses Offered Through The Emergency Care & Safety Institute.Based On The 2010 International Consensus Guidelines For Cardiopulmonary Resuscitation (CPR) And Emergency Cardiac Care (ECC), Advanced First Aid, CPR, And AED, Sixth Edition Is Ideal For Use Within College-Level Courses Designed To Certify Individuals In First Aid, CPR, And AED. More Than A Stand-Alone Text, This Student Manual Is The Center Of An Integrated Teaching And Learning System That Offers Many Resources To Better Support Instructors And Prepare Students. This Manual Includes:Coverage Of The 2010 CPR And ECC Guidelines: Clear, Concise Direction On How To Perform CPR And Use An AED During An Emergency.Current Information On Injuries And Illnesses: Core Information For First Aiders Presented In A Clear And Straightforward Format.Skill Drills: Offer Step-By-Step Explanations And Visual Summaries Of Important Skills.Emergency Care Wrap-Up Tables: Provide A Concise Summary Of What Signs First Aiders Should Look For And What Treatment Steps They Should Take.